A girlfriend and I had a short two and a half days to spend in Croatia the other weekend. If you don't read any further, I'll sum up by saying Croatia is great and it's beautiful and an inexpensive place to visit. It was cheap (oh so cheap. I love a good deal and found MANY while there! ), beautiful, culturally interesting, and had plenty of history to keep even the anti-history person interested (you know who you are). So due to my logistically flawed plan, we ended up spending a fair amount of time on buses. I added it up, and in the 52 hours that we were in Croatia, 18 of those were spent on a bus. Whoops! The cheapest flights went to Zadar, and everything I had read said to go to Split. On a map and according to what I read online it didn't look like too long of a bus ride. Maybe 2 2/1 hours. Well, it was more like 3 1/2 - 4 hours each way. To add to that we also took a bus trip from Split to the Plitvice Lakes, which meant even more bus time since Split is south of Zadar, and the lakes are north of Zadar. In my defense, I didn't book this side trip until after researching that it's one of the top places you must visit in your lifetime (and it was well worth it!). Luckily the flight was only a little over an hour and thankfully my friend is easy going and it didn't bother her. On a positive note we did get to see a lot of the Croatian countryside as well as a lot of shoreline as the bus drove mainly along the coast. I didn't realize that Croatia had so many islands either. 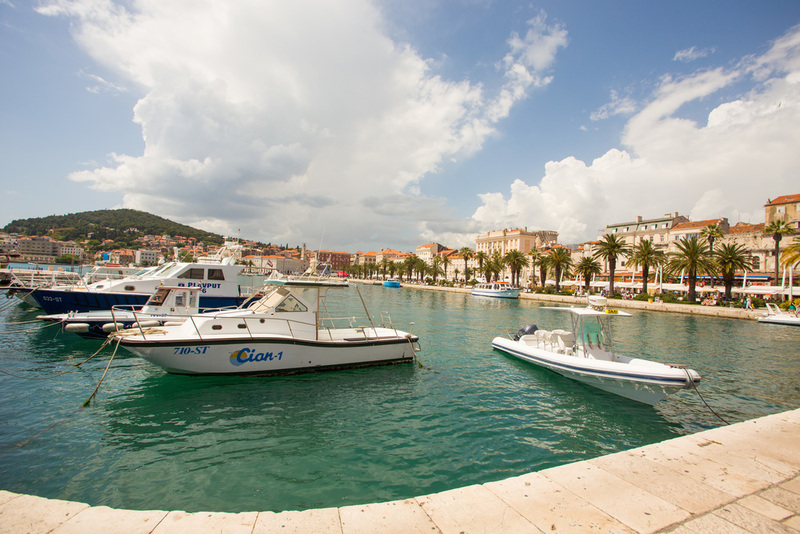 There are plenty of ferries and companies that offer island hopping in Croatia if you're interested. There are some blue caves on an island near Split that I wanted to see while we were there but we didn't have time. 2 1/2 days just isn't long enough! If you have a week there the bus is actually a nice way to see more of the country, and you'll meet some interesting locals as well! I checked the weather before we left and it had said it would be mid 70's the entire time. That sounded about right for a trip in May. When we arrived, however, it was much warmer than that. The weather was in the low 80's and humid as well. It was a nice change from Germany! We left Germany at 6:55, arrived in Zadar a bit past 8am, and after our 4 hour bus ride we finally arrived in Split at 2pm. If you take the bus you'll know you've reached Split because it stops at a large bus station and that's where everyone departs. I could immediately see why people recommended Split. 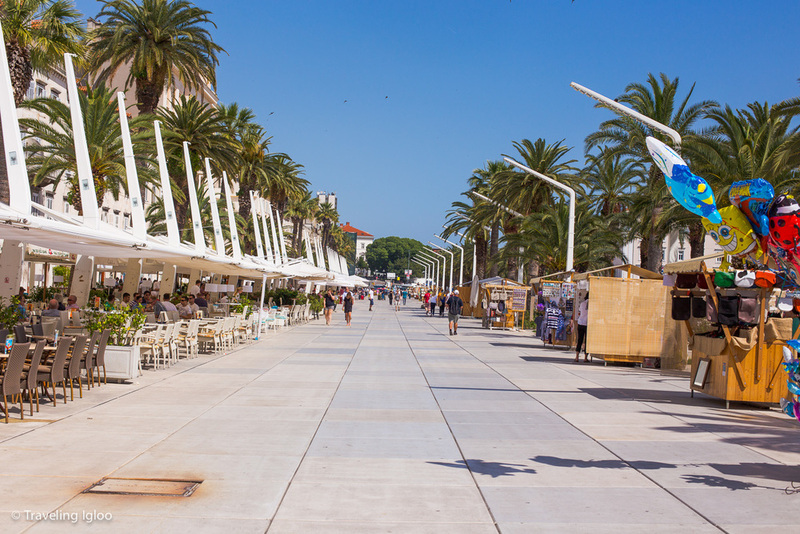 The Riva promenade was quite nice and had bars and shops, and I could already tell it was much more lively than Zadar would've been. There are plenty of beaches in Split, and I learned that one of the islands you could see from the shore had a really nice secluded beach. I'm sure there's more than one, but someone had told us all about how he did it the day before. Once we arrived and settled in to our place, we headed to the beach! We soaked up some vitamin D for a while then walked around and grabbed dinner along the shore. We happened to stop at a really nice restaurant and the prices were still all really reasonable. Main courses were about 10-15 Euro, which is cheaper than in southern Germany, especially considering this was a nicer waterfront restaurant. Marmontova is a popular shopping street in Split. It's a very wide pedestrian street right next to the palace. The street leads straight out to the boardwalk and ocean. The promenade had cafes, restaurants, live music, and a great view. I booked a place through airbnb inside the Diocletian Palace. When I researched online I didn't really pay attention to what the palace entailed. I figured it was another beautiful palace/castle like place that we could pay to visit. Well, it was much more than that. The palace is huge, it's more like a mini city of old town area inside the huge square palace walls. If you Google it you'll see how much of the area it takes up. Inside are shops, restaurants, bars and pubs, cafes, and all these winding streets as well. There are also a lot of stray cats. Because the palace was built for a Roman Emperor, the outside walls, the statues, and much of the structures inside have pillars and walls of this old Roman architecture. Once inside you can walk underground where small shops with jewelry and other items are set up. If you have the chance while in Croatia I highly recommend Split if only for the Diocletian palace. The beaches were nice too, although I'm sure there are many stunning ones along the Croatian coast! As with anywhere, once the sun went down the mood changed. On the morning we left I grabbed a few shots of the bay area before we had to say bye. While it would've been nice to see more of the country, I'm glad I at least had a few days to explore and get a taste of life in Croatia.